•	Features the school name gold embossed on black and purple museum-quality matting. •	It is framed in Gallery moulding crafted of solid hardwood with a high-gloss cherry lacquer finish and gold inner lip. 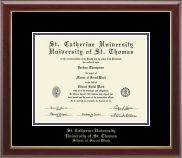 •	This frame is a joint program for University of St. Thomas and St. Catherine University. •	This frame fits a Master's degree. •	Document Size: 14"w x 11"h 18GR GALLERY GRAD Shipping is $21.95 due to size of box.